Performing in an ensemble is at the heart of playing an instrument. By performing with others, musicans are able to create music that they would not be able to alone. They work together to meet common goals, and share the success of a great performance. Students who are not currently taking private lessons with Ms. Myers must audition for placement, as students will be placed with others with similar abilities. Each season, students will be given options of ensembles based on availablity such as trios, quartets and quintets. 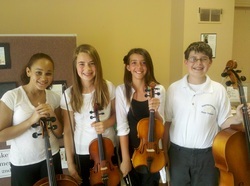 I look forward to working with each ensemble to help them improve their musicianship while having fun! I encourage my groups to set short and long term goals as well as explore different genres of music and performance styles. Students in performing ensembles experience personal growth that they are unable to when playing alone, as well as building self esteem, making great music and friendships! Ensemble sessions are a seasonal commitment- Summer, Winter and Spring- and meet for one hour each week. Each season, ensembles have the opportunity to participate in community performances, and at the private lesson recitals. Pieces are chosen by the ensemble and teacher to display their talents and musical preferences.